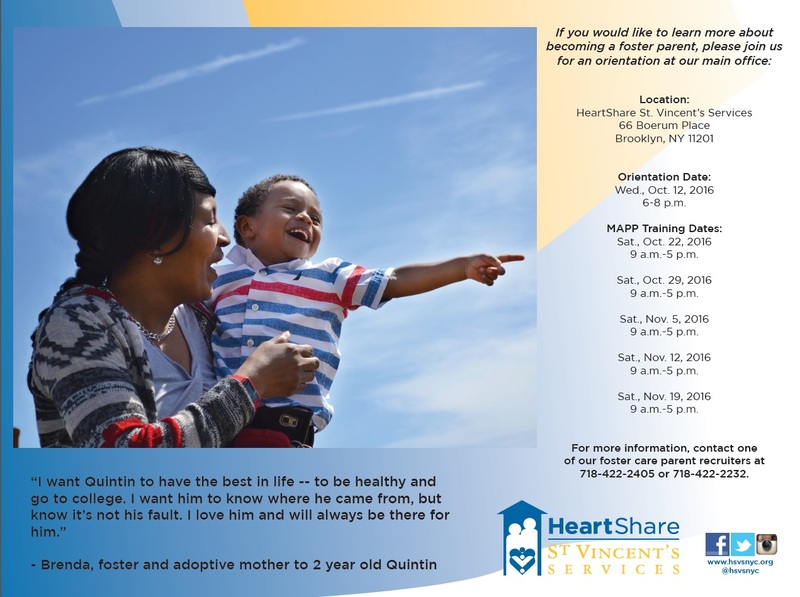 (Brooklyn)–HeartShare St. Vincent’s Services (HSVS) is recruiting foster parents for New York children in need. HSVS hopes to open up 100 new homes to foster children within the next fiscal year. The agency primarily needs homes for babies, teenagers and those with special medical needs. “We are looking for compassionate, open-hearted and flexible people,” said Shivon Roach, Director of Foster Parent Recruitment and Training. To become a foster parent, HSVS rigorously screens and trains eligible applicants. The orientation on Wednesday, October 12 offers an overview of HSVS programs and next steps for becoming a foster parent. Prospective foster parents must attend 30 hours of Model Approach to Partnerships & Parenting (MAPP) training. Following MAPP, parents are required to take additional trainings to complete their certification. For example, to care for a child with special medical needs, parents are be required to take CPR, first aid and other classes. All necessary documentation is required before HSVS conducts a home study to ensure that the home is safe for placements. HeartShare St. Vincent’s Services Foster Care and Preventive Services strives to strengthen families in times of crisis. Last year, the agency placed 827 children in healthier home environments through foster care and adoption. To learn more, please visit www.hsvsnyc.org. You may also reach our foster care parent recruiters directly at 718-422-2405 or 718-422-2232.